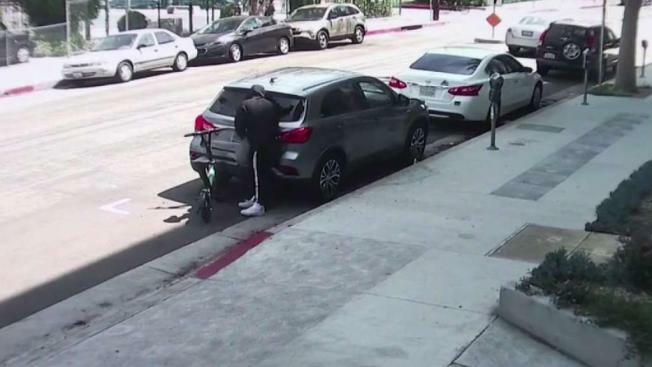 A rash of vehicle break-ins down in Hollywood has left a trail back to the Bay Area, as Los Angeles police believe they have broken up a gang of thieves selling the stolen items on the streets of Oakland. Surveillance video led LAPD detectives to make several arrests last weekend in Hollywood. LAPD said it had 40 car break-ins over the weekend involving thieves on ride-share electric scooters. The thieves wear backpacks and break into cars in theater parking garages and on the streets, where they target rental cars. The surveillance video shows the thieves working in teams, and they work quickly. "This is an ongoing issue for these folks, these suspects coming down to Los Angeles on a weekend, breaking into multiple cars and fleeing back up to Northern California," LAPD spokesman Cory Palka said. "The scooters give then mobility, and in Hollywwod on a weekend night with as busy as it gets, the scooters allow them to maneuver through the community almost at will." Sources within the Oakland Police Department say they have worked similar cases before. Last year, a suspect was busted in Oakland after selling expensive jewels stolen from a car in Beverly Hills. "Oftentimes tourists, people new to community, don’t lock cars and are prone to becoming victims," Palka said. Palka said five arrests have been made, and the Los Angeles and Oakland police departments were working together on the ongoing investigation.